"As laid-back as can be." To that I mean that “The Curious Case of Love Live!” from being what was supposedly a tribute post to the end of μ’s, has now become an outlet through which I churn out thoughts and ideas about the successful idol phenomenon in anime (“the Grand LL!usion” , if you will), the more immersed I become with the franchise. So far we’ve tackled “interpellation”, in what I viewed as the subversive inclusion of idol viewing culture into anime viewing culture, consequently homogenizing the two as a singular 2.5D viewing experience; and we also went into the concept of “spectacle” in the idol performances of Love Live! and how that translates to the aforementioned 2.5D nature of the franchise. I figured I should dial it down a bit for the next one of these lest I lose sight of what I initially intended this series to be — that is to make sense of the ever-growing phenomenon that is Love Live!. 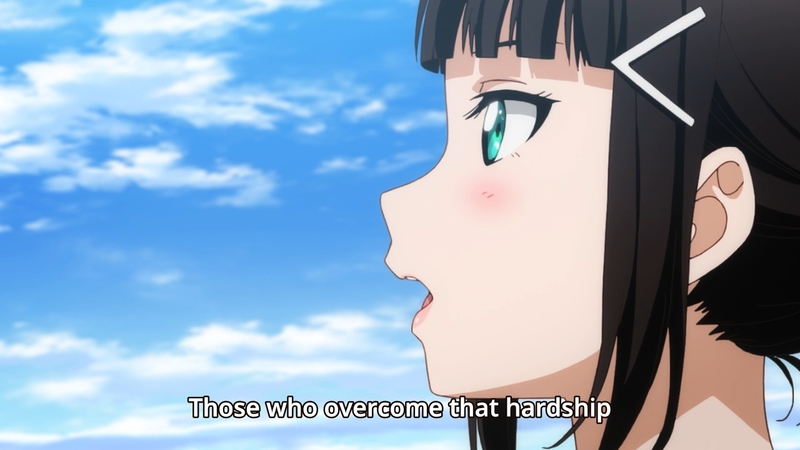 While it is fun (for me at least) to go over different academic theories and try to relate ’em to semi-fictional school idols of all things, sometimes the simpler connections end up offering more clarity; and where better to find them than in the medium itself, anime. We shall revisit the anime side of things and remain solely on that side of the screen for the duration of this post. No analyses on the socio-cultural mechanics behind both the idol as the individual and as an institution. No emphasis on the 2.5D paradigm. No theories. None of that. Instead our approach at this time will focus purely on the narrative being delivered by Love Live!, and how that narrative might resonate to the anime viewer in a (hopefully) unexpected way — which is great since the second season of Love Live! Sunshine!! has just started and if you’re still on the fence about the series then maybe this article could shed some light into what (I think) makes this show so appealing to some, if not a whole lot of people. The title gives away my main point for this iteration of Curious Case, but all the same (and for the sake of clear direction), for the next couple of minutes or so I posit that Love Live! 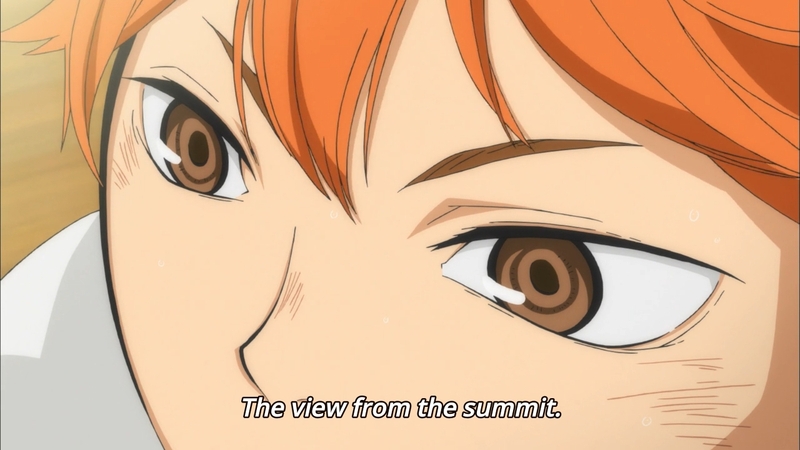 is a sports anime. 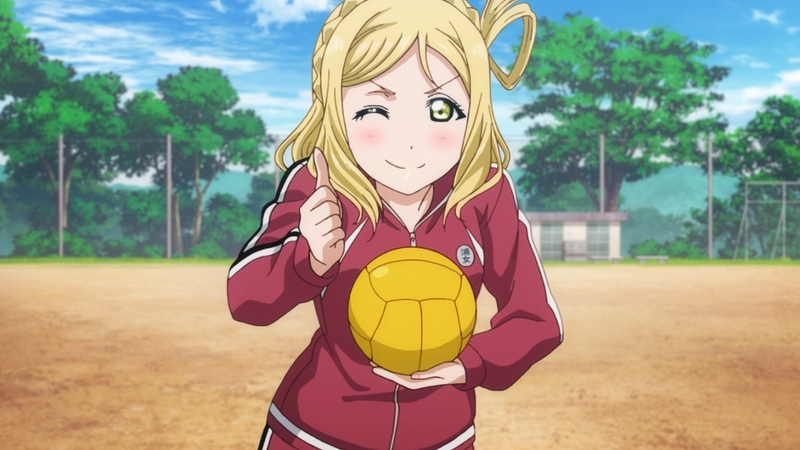 …I mean, c’mon, not in the sense that there’s an actual sport inovolved, but rather I contend that at its very core Love Live! presents itself as a story of working hard towards a very clear goal, which mirrors the key narrative of most, if not all, sports-themed anime. It’s no secret that one of the main drives of Love Live! Sunshine!! and the idol group Aqours, compared to its predecessor the original Love Live! School Idol Project and μ’s, is that it manages to (arguably) better portray the struggle towards something much larger than themselves. Its main theme revolves around “starting from 0”; making something out of nothing through the unified will and determination of nine people. Students coming together in the spring-time of their youth to “achieve their dreams” as they aim for the grandest stage allowed to them; to pull-off nothing short of a miracle. Notice how that sounds right about the same as, say, a baseball anime for example? Nine people in a club working towards one goal (I mean, of course, there’s more than nine people in a baseball team, but just go with the analogy for now xD) For high school baseball teams, as some of you may already know, it’s reaching “the Koshien” (in particular the Summer Nationals held at Koshien stadium for all participating high school teams in Japan); and for the school idols of Love Live!, it’s being able to perforam at “Love Live!”, the most prestiguous (albeit fictional, lol) school idol tournament in Japan. 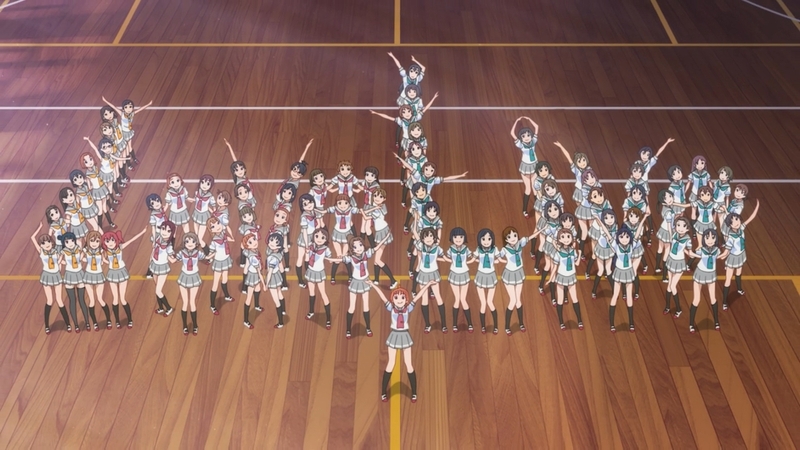 While these themes collectively do already contribute to the vagaries of its correlation to sports anime in general, what really tipped me over the edge with this idea was this scene from the first episode of the second season of Love Live! Sunshine!! (minor spoilers ahead). 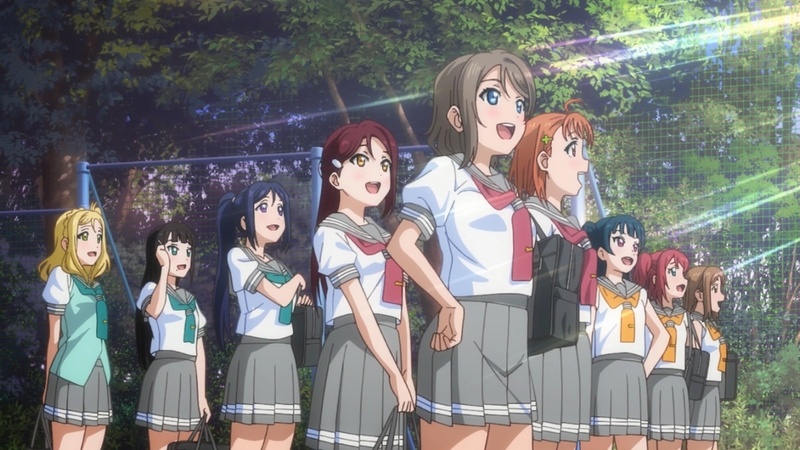 Chika, the consensus leader of Aqours, receives from her schoolmates one-thousand origami cranes as a show of their support for what the girls are trying to achieve. 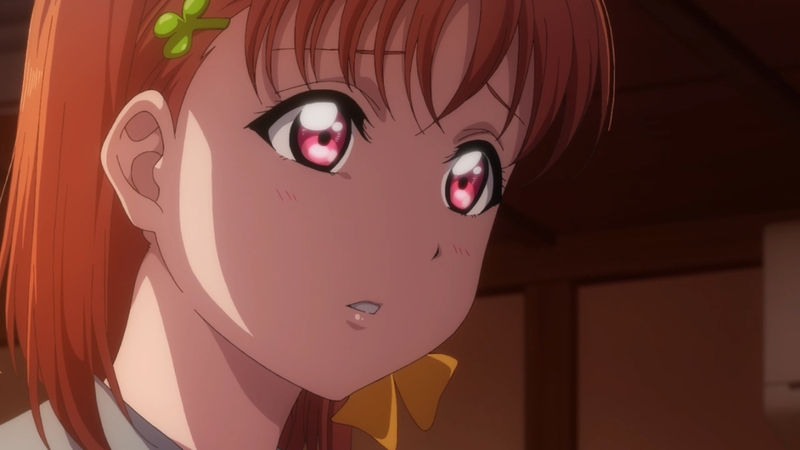 It was during this time that Chika’s resolve for pursuing Love Live! had begun to waver, after finding out that she may have to choose between saving her school and participating in Love Live!, instead of them being one singular goal originally. The cranes serve to remind her that she can’t give up on either after all. The thousand origami cranes or senbazuru (千羽鶴) is a hand-made ornament which, as it sounds, is made up of one-thousand paper origami cranes held together by strings. 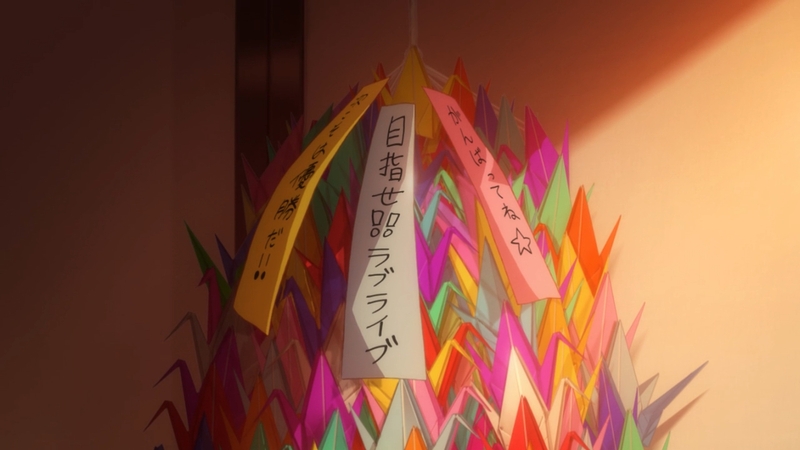 It is said that anyone who folds one thousands paper cranes will be granted one wish. Traditionally one does not keep the thousand cranes for themselves, but rather it is offered to someone with the intent of wishing them good fortune in a certain aspect of their life (ie health, marriage, etc). Upon seeing one used in Love Live!, I couldn’t help but remember one scene from Big Windup! (the clip above), where the captain of Tosei High School gives a thousand cranes, that was originally offered to them by their supporters in wishing them good luck in the national tournament, to the Nishiura High School Baseball Team . Tosei, upon losing the qualifiers in a close game to Nishiura, passes on the thousand cranes (and the sentiment that comes with it) to Nishiura in a rather moving scene that arguably serves as the denouement for the entire season of Big Windup!. The two scenes ran parallel in my mind for some time until I realized what I truly felt for both. Both Chika and the Nishiura boys were able to stand anew through a similar gesture shared between them; and although that gesture may not be mutually exclusive to sports anime alone, the purpose it served was more or less the same. “Good luck”, “Do your best”, “Aim for it”. It is here that I would argue that Love Live!’s approach towards school idols is very much in the vein of shounen sports anime. Which, is partly amusing for me to say because the Love Live! franchise is notorious for not having a single male character appear on screen ever (but that’s another topic altogether). For now, let this go to show that being “shounen” does not always necessitate having young men showcasing myriads of powers in battle, as the vibe of stories dubbed as shounen generally highlight the hard work that the titular shounen character/s go through in attaining said powers — or in the case of shounen sports anime in particular, how they get to the level of skill they’re at over the course of some period of time. “Hard work pays off” is a catch-all narrative that much is true, but in the context of high school hopefuls giving it their all, surely nothing strikes closer to home than high school sports. They’re all stories featuring the zeal of youthfulness, camaraderie, and earnest desires; whether its the ‘ol Devil Bats in the gridiron, Karasuno on the courts, Seidou on the diamond, or μ’s and Aqours on the stage — the setting for each and every one might be different but the sentiment remains the same across all of ’em. 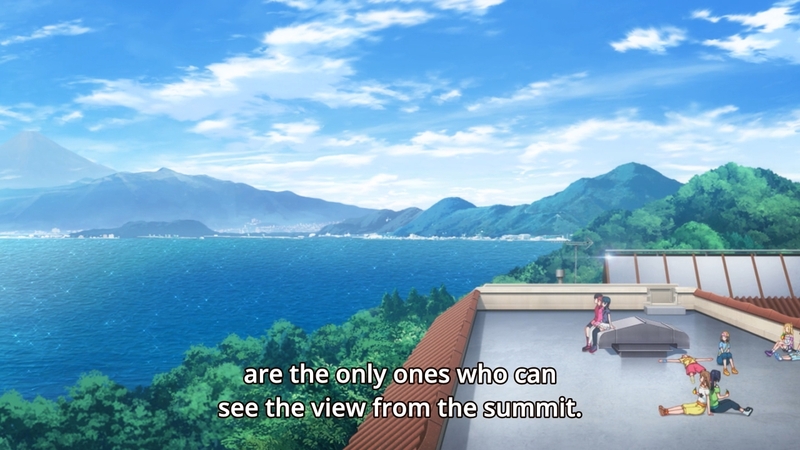 They want to reach that “view from the summit”. Love Live! is “the Koshien” of school idols (as far as the universe within the story is concerned). I offer you this perspective. This entry was posted in Articles and tagged Anime, idols, love live sunshine, shounen, sports anime by Leap250. Bookmark the permalink.